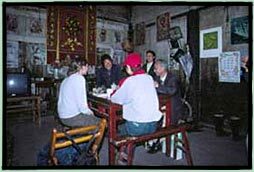 On April 12, 2001, two teachers accompanied six high school students from Newton, Massachusetts, to Huang Cun village in China to take part in the Yin Yu Tang Service Project, sponsored by the Peabody Essex Museum and the Newton Public Schools. Students were chosen based on their interest in Chinese culture and fitness to travel in rugged conditions. The mission of the project was to study Chinese architecture and to gather oral histories from residents of Huang Cun-Yin Yu Tang's original location-to be included in the Peabody Essex Museum's collection. In preparation for the trip, the students studied Chinese art and architecture as well as the regional culture of Anhui Province, in which Huang Cun is situated. During their week in Huang Cun, students learned about the daily lives of Chinese high school students. Each Newton student was paired with a student from Xiuning High School to interview a family currently living in Huang Cun. After the interviews, the students had lunch with the family, enjoying such home-cooked regional dishes as duck, young bamboo shoots, and mountain fern. The program continues on an annual basis. In May 2002, Chinese education administrators and a teacher from Xiuning High School visited the Peabody Essex Museum, as well as the Newton schools and Salem High School. In 2003, Chinese students will visit Massachusetts. Below are two excerpts from the oral history projects that the students conducted in Huang Cun. The first is an excerpt from an interview; the second is a narrative. "When I was younger I usually would work in the fields. I plant the seeds for many of the vegetables I eat or pick tea from the mountains. When I pick tea, I will rise at 5:00 in the morning and pick tea until it is time for lunch. After lunch I will return to picking tea until 5:00 in the evening. "I have two kinds of tea that are my favorite. One is black tea and the other is a special tea from my village. In the village most people drink tea, but in the summer the children like to drink soda. I will buy a bag of powdered milk at the market if I want milk, but I don't drink it often because I live in the countryside. I usually eat lots of fruit, like bananas, pears, grapes, and strawberries. In the summer we eat watermelon. All of the fruits we buy from the market because we are not able to grow them." A mother stands by the stove, hard at work preparing dinner. Lifting her head up, she calls to her daughter to come and watch her. In this way the daughter not only learns her mother's recipes, she learns to cook herself. No men are in sight. This is a typical scene in the kitchen as described by Mr. Wang Xuren of Lower Huang Village. According to Mr. Wang, the process of preparing food goes through many steps, both inside and outside of his home. The Wang family provides themselves with almost all of the food that they need. They grow radishes, beans, Chinese cabbage, pepper, eggplant, and rice. Mr. Wang described the process of growing crops. He uses a water buffalo, plow, and hammer-like tool to prepare his fields for planting. Twice a year he will plant a rice crop, but in the winter he will grow rapeseed. The rapeseed that he raises is processed into oil that is used for cooking. In order to provide his family with the necessary rice, Mr. Wang spends ten or more hours in his fields. However, during the winter, Mr. Wang spends only five to six hours in the field. Except for excess rice that is sold in town, the family uses everything that they grow in their kitchen.